“Our decision to invest in these capital improvements will increase the overall quality of the property, while continuing to attract top-tier tenants,” says Nahla Capital's Andrew Liebhafsky. 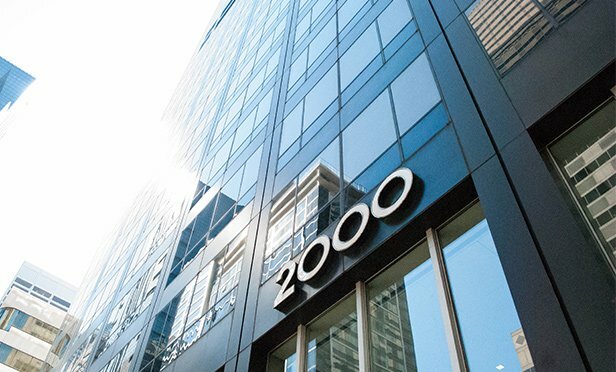 PHILADELPHIA, PA—The new ownership at 2000 Market Street has plans to invest more than $7 million in major capital improvements, including new cooling towers, elevator modernization, a fire alarm upgrade, and facade restoration. A New York-based partnership led by Nahla Capital acquired the 665,000 square-foot class A office building last year. Over the past year, Nahla has launched a capital improvement program for the building worth more than $7 million to be completed over the next three years. In the last 12 months, the CBRE team of Joseph Wolff, Kevin Maloney and David Mendez, on behalf of the landlord, have leased more than 60,000 square feet at 2000 Market Street. Last September, one of the building’s tenants consolidated its operations and signed a long-term lease renewal and as a result, 25,666 square feet will become available at the property in the third quarter of this year—the first full-floor availability in 10 years. “With the building currently 98% occupied, this investment by Nahla Capital demonstrates their commitment to proactively improve the overall tenant experience,” says Kevin Maloney, senior vice president, CBRE.